As it turned out, the weather was not better; it was even worse, if that’s possible. Undefeated by the elements, we’re so happy that we kept driving and didn’t turn around. There were a few friends of theirs who arrived, like us, a bit early to help celebrate the birthday of their daughter Saphire, and enjoy her chocolate cake and tea. The guests included two vivacious women who are building a log house by themselves and dreaming of having a new and different life together; and a couple who travel throughout Europe on their tandem bicycle and are now planning to cycle across America. Everyone dressed up for the evening, and ran through the rain and mud to our cars. Racing up and down a narrow road, chateau ruins in the distance that lit up the stormy night sky, we followed the lead car to a theater tucked away in the countryside far from the village. The stage was lit with tall candles, and in the middle an iron tripod stood with a chain holding a big iron pot. A red clothesline was strung with brightly colored laundry. 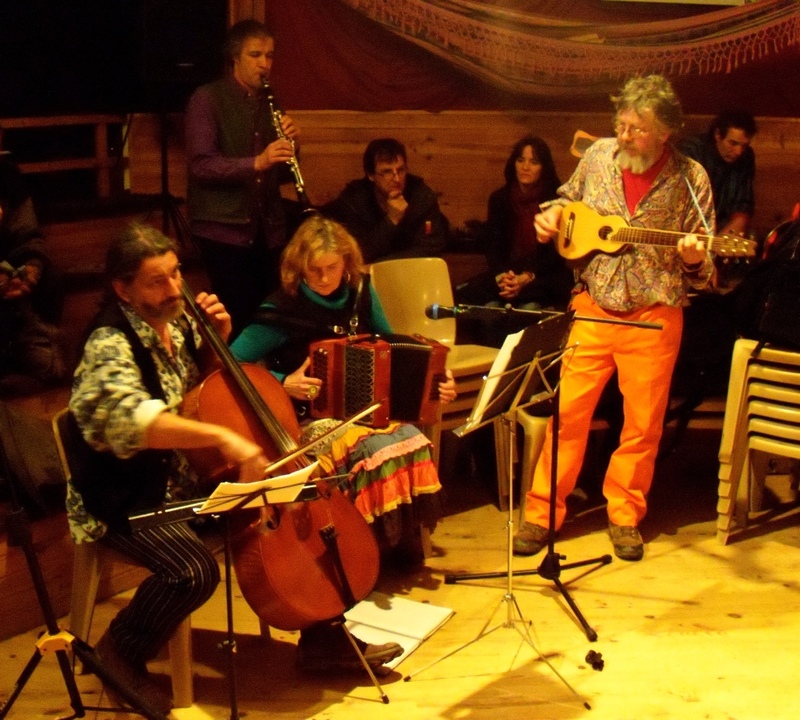 The rhythms of gypsy music completed the ambiance, for this was an authentic ‘roulotte encampment’. Men and women, dressed in festive shirts and long, brightly colored skirts, began to drift in, their children running in all directions. A large rustic table began to fill with wine, cheese, bread, and an enormous pot of soup; and dogs stopped by to sniff their hellos. The Roulotte Papillotte story unfolded in beautiful photos–the story of a young couple with two small daughters who left their home in Holland to travel in their roulotte. They have traveled for 13 years and 16000 km. through five countries and in all seasons. Two Fjord horses, Gea and Terra, have pulled them through the ever changing countryside. There were photos of two lovely girls, Saphire and Yentl Rose, growing up and finally, as teenagers, having the gift of a roulotte of their own. Hundreds of moments were captured by André’s expertise with a camera. Some are of sunny days on the beach, some over looking the ocean from a towering cliff, and still others of the two roulottes barely able to pass through narrow lanes in ancient villages. Images captured camping in the snow, and some amidst spring flowers. Gea and Terra were shown tethered at a local laundromat, steaming in a frozen landscape. Summer days captured Judith and the girls painting faces and selling photos at fairs. We saw how difficult it can be to train a stubborn horse to work , as they experienced with Saartje, who pulls the small roulotte. There were many, many more. A commentary and hundreds of exceptional images told the story of an extraordinary life, of brave and creative people living their dream and loving every moment. Soup and drinks were served after the slideshow, and posters and postcards were sold. A young man came over and sat next to us; he began to ask about my plans for Tòti Bleu. This engaging man began to share his story; I hope to tell his tales at another time. A group of musicians began to play, a couple danced, there was interesting conversation, and slowly the theatre began to empty. 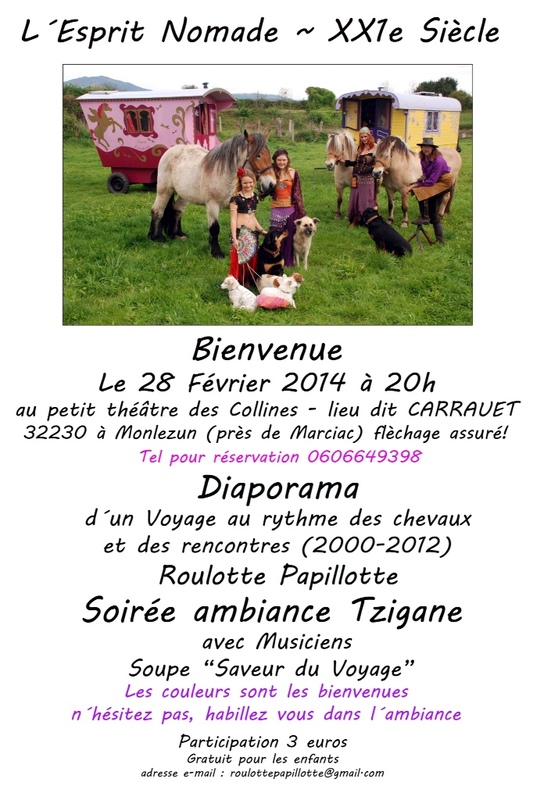 The first day of March had already begun when we arrived back at the roulottes. Earlier we had set up our inflatable mattress and the three quilts. When Mark and I finally fell into bed, the mattress had already leaked, and we landed onto a hard floor. Laughter and hugs! as we fell into a deep sleep. The morning welcomed us with clear skies; and three horses stretched their necks from their nearby stable to watch us wake up through our windows. My resolve to travel in Tòti Bleu deepened even more. 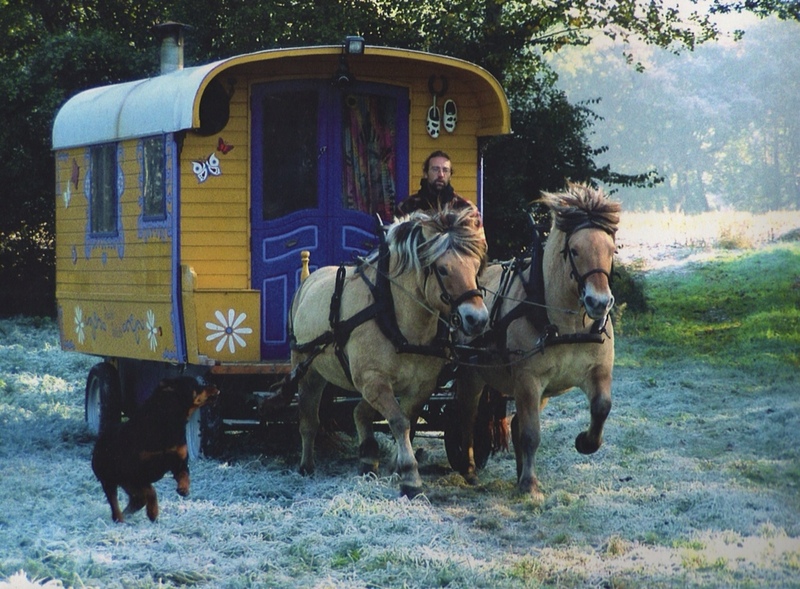 This entry was posted in Community, Lifestyle, Travel and tagged Art, building a gypsy caravan, Creative living, France, Gypsy wagon, Horse lovers, Lifestyle, Roulotte, Scale model of a roulotte, vacation rental SW France. Bookmark the permalink. Suzanne, What a wonderful family story. What a wonderful way to live. I love it. I’m very happy to find your blog also. Thanks for your nice comment!